Unlike the majority of my compatriots I am not a habitual tea drinker. When I feel fuzzy in the morning or weary in the afternoon I do not reach for a cup of comforting warmth. It's not that I actively dislike tea, I just never really saw the point. A few weeks ago that changed. I didn't have a sudden change of heart about a milky cup of builders' tea. I did visit TeaSmith, a tea shop and bar in Spitalfields, where I was introduced to a whole new world of taste. I'd been meaning to visit TeaSmith for a while. I don't live that far from it and with a small diversion it can actually be on my walk home. It does close at six in the afternoon though. An early finish at work and a visit East from my newly West London friend Merilyn provided the motive and opportunity to murder a cup of cha. TeaSmith is a small niftily designed shop on the north side of Spitalfields market with a small bar at the front. We asked if we could taste a few kinds of tea and the nice shop assistant nipped downstairs to speak to the owner. A few minutes later we were sat at the bar with freshly lasered tasting notes about to embark on a tea 'Masterclass'! John Kennedy, the owner, is a Scot with a serious love of tea, an enthusiastic evangelist who not only believes but delights in his products. His teas are predominantly Chinese, though with some other teas available, sourced directly from his source in Hong Kong. The tasting was accompanied by a detailed commentary covering the history, culture, cultivation, potential health benefits (Western and Chinese) of tea and much much more. The presentation of the tea itself is performed through a sort of rationalised version of a Chinese tea ceremony where John as the tea master is explaining what he's doing and why he's doing it. Various tea pots with different levels of porousness are used, water is heated to different temperatures using a digital thermometer and different infusion lengths are used. 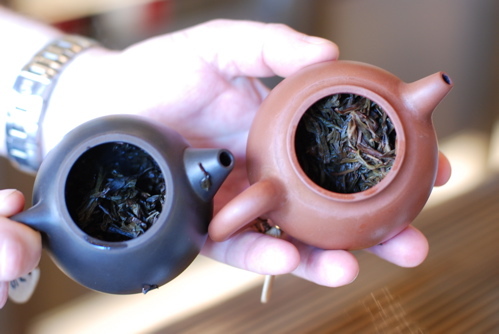 The water is poured in separate stages for each tea for rinsing and infusing . . . much ends up falling through the slats of the specially designed bar. It's mesmerising to watch. 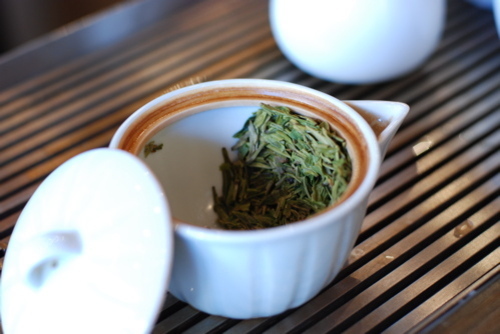 Teas go through multiple infusions with the tastes developing and changing over each iteration. Another great thing at TeaSmith is the William Curley cakes on offer. I've never really given tasting notes for anything on this website, mainly because I've always doubted my palate and my articulacy, but I think it's probably worth noting exactly what we had, what the Tea Smith notes were and what I thought. So, here goes. TS Notes: "Gorgeous hand-picked buds showing fragile white hairs. Delicate and subtle fresh aroma. Lingering sweet aftertaste"
TS Notes: "Most famous (probably) Chinese green. Hand-fired characteristic blade shaped leaves. Crisp texture, malty, nutty taste"
Me: Verging-on-bitter, chestnuts, light, reminiscent in some ways of some English Spring ales! TS Notes: "Twisted and expertly fired leaves descended from famous tea trees over 500 years old. Intense aroma of ripe fruit with an exceptionally long and sweet aftertaste"
Me: Reminiscent of red laces chewy sweet (but not chemical). Very long, peach and plum aromas from pot . . . mellower in the mouth. TS Notes: "Twisted, charcoal fired leaves from a direct propagation of the 500 year old 'Red Robe ' plant itself. Warm, floral aroma with a hint of charcoal. Full bodied taste with rich and complex aftertaste. Exceptional digestive. Me: Oily, thicker mouthfeel at lower temperatures and later infusions. Very long, changing taste with sweet and bitter notes revealing themselves. Very smooth and soft. TS Notes: "Full-bodied and exceptionally silky tea from the second flush of premium Long Jin"
TS Notes: Hand picked tippy leaves undergo a secondary fermentation and careful aging. Rich earthy and woody fragrance with complex smooth taste. Me: Amazing loam taste, I was transported back to playing in the woods as a child. My friend was reminded of a smoke sauna (Estonian thing . . .). Yak sweat! I can imagine this being a great after dinner alternative to coffee. As I said at the beginning of this post, I don't drink tea normally. In fact, I don't drink caffeinated drinks at all . . . one of the reasons for this is that coffee makes me strangely agitated and horrible to be with. Three hours of tea at Tea Smith, certainly made me very very very alert and put me in a startlingly good mood. This kind of tea has a much higher caffeine content than 'normal' tea . . . be warned. I buzzed off for a pint, no nasty comedown descended and all was well. I shall return to TeaSmith. 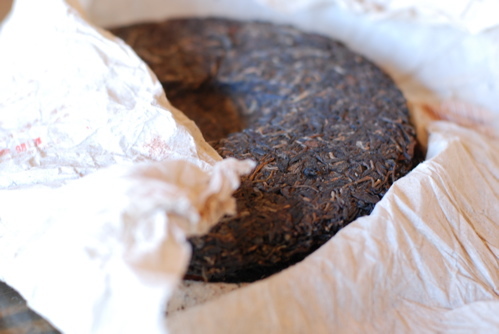 Pu'er is my favourite tea. It is said that this tea has slimming effects, but it could work both ways. Having it before and during food will increase your appetite, having it after is good for detox and digestion. Don't know if it's an old wives' tale but I've never tried otherwise. Nice blog.Verging-on-bitter, chestnuts, light, reminiscent in some ways of some English Spring ales!I like it. Where can I get the grass green tea of high quality?